Berkeley DB is a general purpose embedded database engine that provides data management features found in enterprise class databases. Berkeley DB is used in various applications ranging from cell phones to e-commerce systems ranging in size from a couple of megabytes to several terabytes. Included in the 11gR2 version of Berkeley DB is a SQLite compatible SQL API. All administration is performed via API calls so no DBA is required. API’s are available for many programming languages including C/C++, Java and C#. 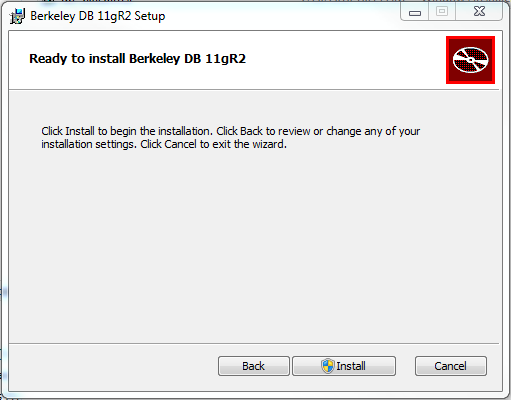 This document will detail the installation of Berkeley DB 11gR2 11.2.5.0.26 on Windows along with creation of a database using Berkeley DB SQL Interface. Double click the db-5.0.26.msi to start the installation. 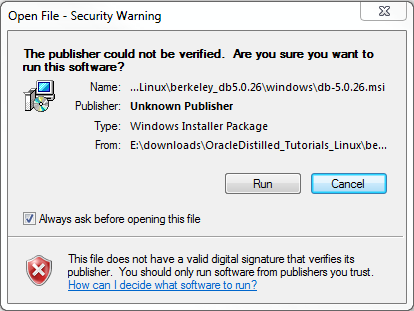 Click the Run button on the Open File – Security Warning dialog. Click the Next button on the Welcome screen. Accept the License Agreement and click the Next button. All features will be installed by default and will consume approximately 100MB of space. You can make changes to suite your environment. Note the default install location is C:\Program Files. If you do want to install in this path click the Browse button to select another location. After making your changes click the Next button to continue. 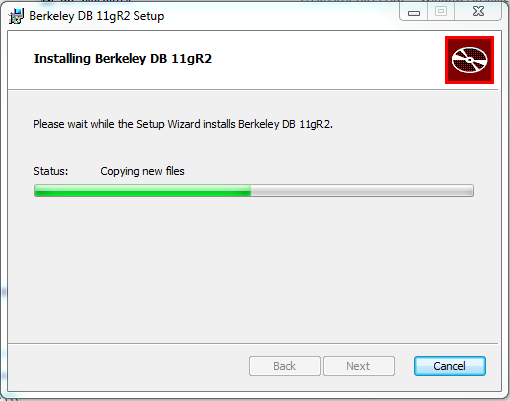 This is the last chance you will have to make changes prior to installing Berkeley DB. Click the Back button the make changes or click the Install button to start the installation. Note: Depending on your version of Windows you might be required to approve installation. A progress dialog details the installation process. Click the Next button once the installation is complete to continue. Installation is complete. Click the Finish button to exit the setup wizard. 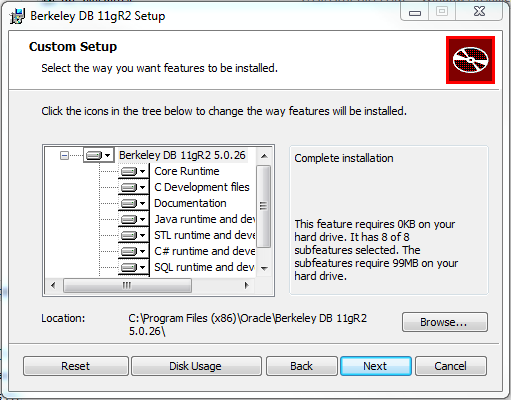 The Berkeley DB SQL Interface is a command line interface into Berkeley DB that is nearly identical to SQLite. Berkeley DB SQL Interface (dbsql) is automatically built and installed for Berkeley DB on Windows. Make sure that the BDB_HOME/bin directory is in your path or provide the full path dbsql.exe. Note: If your path contains spaces you will need to wrap the path in double quotes. Below we start the Berkeley DB SQL Interface passing the database testdb.db. Since the database testdb.db does not exist a new database will be created. At this time if you were to look on the file system you would see that the directory is empty like below. 07/20/2010  01:17 PM    <DIR>          . 07/20/2010  01:17 PM    <DIR>          .. Nothing is wrong. At this time the database is empty so no file has been created. Back in DB SQL we create a simple table. As in Oracle SQL*Plus, SQL statements are terminated with a semi colon. Next we will insert some values into the table followed by retrieval. Now if you look at the file system you will see that the testdb.db file has been written along with a directory called testdb.db-journal. 07/20/2010  01:29 PM    <DIR>          . 07/20/2010  01:29 PM    <DIR>          .. The testdb.db-journal directory contains Berkeley DB environment information that is intended to persist between transactions and process runtimes. Do not delete this directory or any files contained within it. 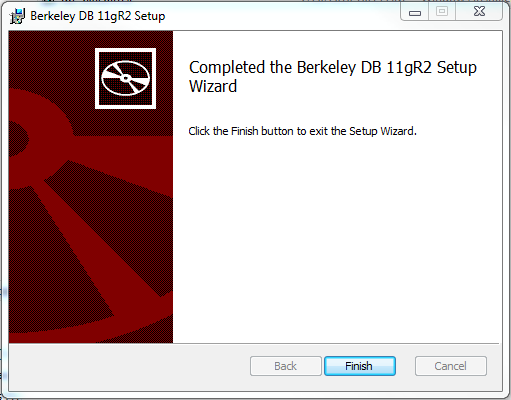 In order exit Berkeley DB SQL Interface enter .exit on the command line. 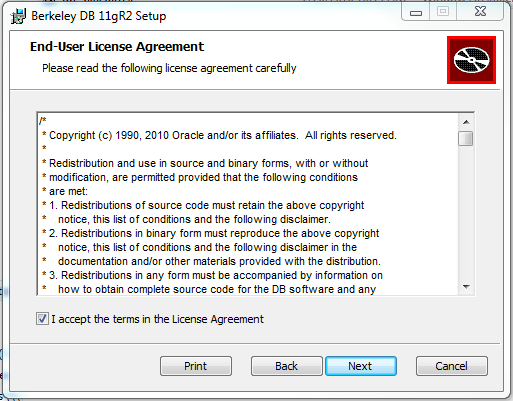 More information about the Berkeley DB SQL Interface along with Berkeley DB in general can be found in the documentation located either online on locally in the BDB_HOME/doc directory. you have an excellent document above but I wonder how to create the Database? When you start dbsql.exe you can pass the name of the database in which to connect. If the database does not exist the database will be created. For example DBD_HOME\dbsql.exe newbdb.db will create a database called newbdb.db in the current directory if does not already exist. No files, newbdb.db or the journal directory, will be written to the file system until data is stored into the database. Now I created a bdb directory in bin and on root c: as wel. I have created the table and inserted data into it. to save the data entered, do I have close the table and database as well? because when I exited the data was gone which I recreated again. Would you please wirte me ” how to close the table, db and save the data inserted”? How did you exit the database and how did you reconnect? Below is the output of creating a database named zack.db, creating a table and inserting some records. I then exit the dbsql and restart it connecting to the database zack.db. I then select * from the table again and finally exit the dbsql again and show a directory listing. To exit dbsql use the .exit command. One thing to note about the example below. My databases are created in a directory called E:\source\berkleydbs and provide the full path to the dbsql executable along with the database name in the command prompt. 03/17/2011  12:26 PM    <DIR>          . 03/17/2011  12:26 PM    <DIR>          .. I did another test just like the output above except I closed the dos (cmd.exe) window instead of exiting dbsql using the .exit command. When I reconnected to the database the table and data were still present. Make sure you know which directory you create your database in and besure to either be in that directory when starting dbsql or provide the full path and the name of the database on the command line. lesson learned, when installing BDB on Windows; give a short part on root to make life easier. That is great to hear. I am happy you got it worked out. Hi Eric. I have one question. How BDB SQL interface is different from using just BDB C++ API in creating tables and inserting records and etc.? Will the tables and records created with both approaches be in the same format and have no difference? I am asked to convert some tables in Oracle to their equivilant variant in BDB. Which approach should I choose? Hi Eric, I wanna evaluate the performances of some Native xml databases including BDB. I you have experiance in this field, could you please help me to know the way of creating the database for NXD and how can I import some XML dataset into the created database. how can I uses some queries against data imported to the tabels. I wanna measure the response time for these processes? An innlielgett point of view, well expressed! Thanks!